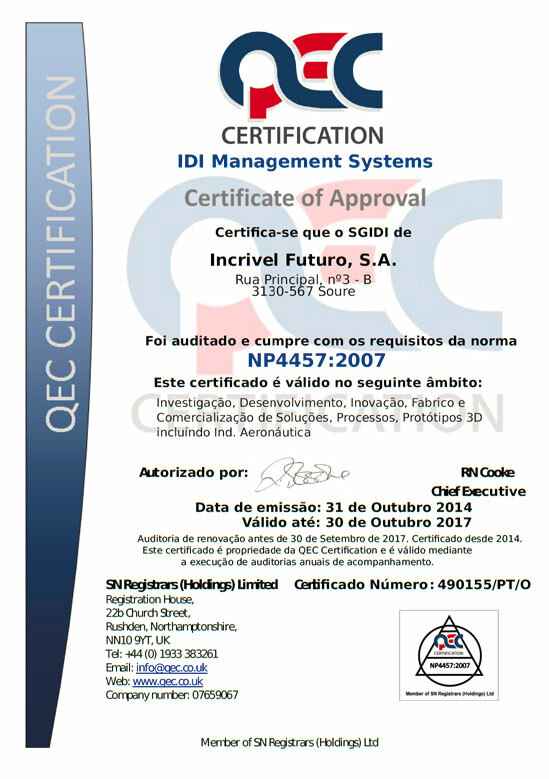 Certifies that Incrivel Futuro, S.A.'s (Zona Industrial de Soure, Lote 9C, 3130-551) Research Development and Innovation Management Systems were audited and fulfill the requirements of the norm NP4457:2007. This certification is valid in following areas: Research, Development, Innovation, Manufacturing and Commerce Solutions, Processes, 3D Prototypes, including Aeronautics. The audit of renewal has to be done before 30th of September 2017. Certified since 2014. 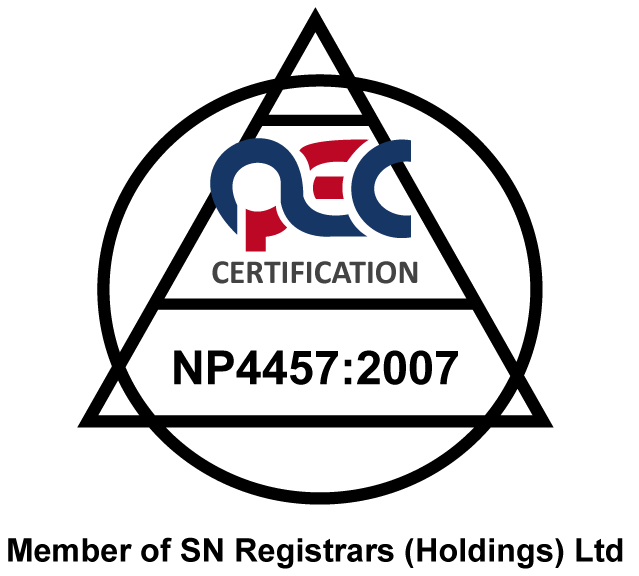 This certificate is property of QEC Certification and is valid by conducting annual audits of monitoring. 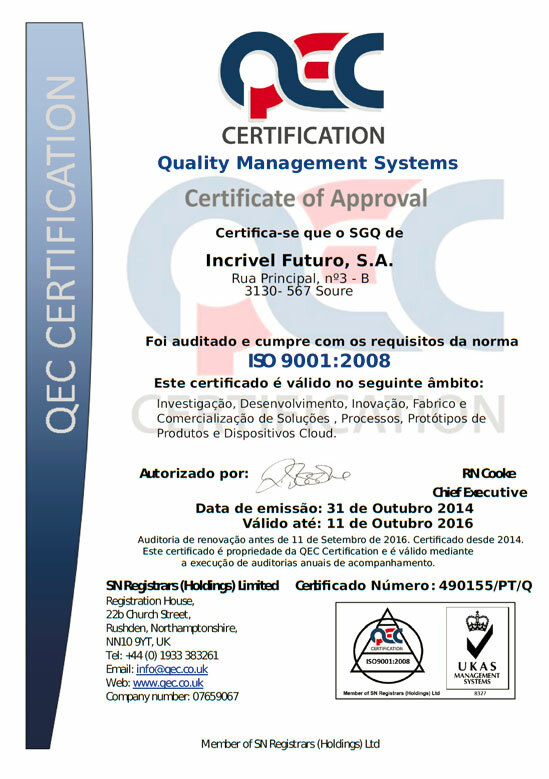 Certifies that Incrivel Futuro, S.A.'s (Zona Industrial de Soure, Lote 9C, 3130-551) Quality Management Systems were audited and fulfill the requirements of the norm ISO 9001:2008. This certification is valid in following areas: Research, Development, Innovation, Manufacturing and Commerce Solutions, Processes, Prototypes of Products and Cloud Power Devices. The audit of renewal has to be done before 11th of September 2016. Certified since 2014. 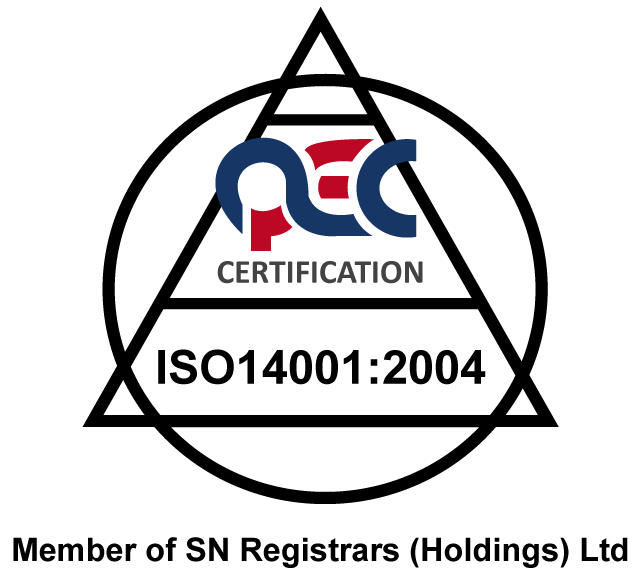 This certificate is property of QEC Certification and is valid by conducting annual audits of monitoring. Certifies that Incrivel Futuro, S.A.'s (Zona Industrial de Soure, Lote 9C, 3130-551) Environmental Management Systems were audited and fulfill the requirements of the norm ISO: 14001:2004. Certifies that Incrivel Futuro, S.A.'s (Zona Industrial de Soure, Lote 9C, 3130-551) Information Safety Management Systems were audited and fulfill the requirements of the norm ISO: 27001:2013. This certification is valid in following areas: Security of Information on Research Activities, Development, Innovation, Manufacturing and Commerce Solutions, Processes, 3D Prototypes, including Aeronautics.